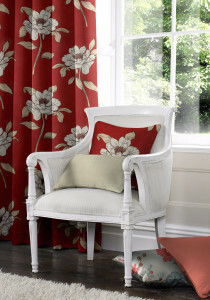 We have a selection of curtain headings that can be used to create a unique look for your room. Whether you require classic pinch pleat curtains or simple contemporary eyelet curtains the best way to set the mood are your windows and the way you dress them. Use one of our own branded fabrics or simply tell us about your design goals and we can manufacture your curtains to your personal specifications. These can also come with matching roman blinds, cushions, headboards. These curtains are also available in a selection of linings including; blackout lining, standard lining, thermal lining and inter lining. 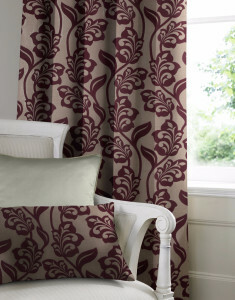 Our range of Curtains are available with matching cushions and headboards. Whatever you need, D & C Blinds can help. Our range of styles are aimed to compliment any vision you may have with your interior design goals. We understand that you want your new purchase to fit in with your interior design motives, that’s why we custom design our products so that they fit in with your goals. We take care in helping you select every detail so that you can be happy, put simply we turn your house into a home. We will help you create the home you want by allowing you to customise every aspect of your product. 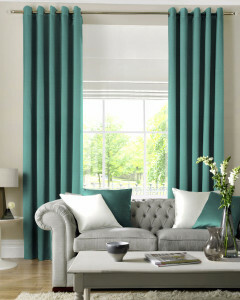 Whether you want 2-tone, 3-tone or banded curtains. We can help ! Whatever you may have in mind, with many years of specialist experience we can go a step beyond others so that you are happy with your purchase and your vision.